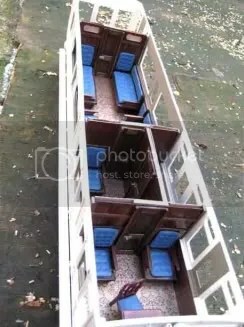 I am grateful to Neil Ramsay for these photos of his wonderful 15mm scale model of CDR six-wheel saloon no 1. The bodywork is cut from plywood, built up in layers to produce the panelling, the use of real wood in this scale gives the effect of the grain, and imparts more ‘atmosphere’ to the model. The axle-guards were gravity cast (from Neil’s masters) in white metal by John Campbell, who also provided the lamp-tops. 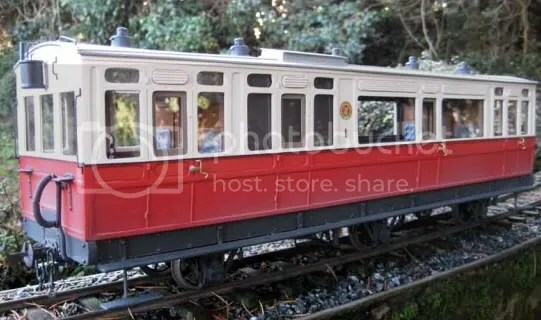 The interior is fully detailed, always a good idea for saloon stock, and especially in the larger scales. The internal mirrors are cut from old CDs with real French-polished woodwork and carpeting from dolls’ house wallpaper. The dining chair is a dolls house model in 1/24th scale, with a new seat from Das modelling clay. They are not really proper scale models of the originals, but give the right ‘feel’ when looking through the windows. The chassis is built with simplified Cleminson units, a mixture of home made components and sprung bearing assemblies from Ron Grant. The centre wheel assembly is shifted sideways by the linkage to the outer wheels. The problem in a model like this is trying to achieve maximum lateral movement of the centre wheels, as this determines the minimum radius (just about 5’) it will go round. Springing greatly improves the running: in fact Neil’s six-wheelers run better than bogie coaches and suffer less from buffer lock as the ends don’t stick out so much on curves. Wheels are Slaters gauge 1 split-spoke 37mm diameter. Neil recommends Slaters 31mm diameter spoked wheels for the 2’ CDR and LLSR wheels. These wheels are coarse scale G1 and work really well in the garden. Hi, Im just about to respray a 16mm loco based on the County Donegal ‘Phoenix’ how ever it turns out the Phoenix precision have stopped doing their range, can I ask what was used to paint this?